I thought I'd start with one of the things that eluded and frustrated me the most when I began blogging; how to make the photos that I posted larger. Especially the photos on my food blog. Not just a tiny bit larger. I wanted BIG. I kept seeing all of these gorgeous photos, jumping off the pages on my favorite food and DIY blogs and no matter how I worded my google queries, I just couldn't find the answer I was looking for. I wish I could remember where it was that I finally found the information I was looking for, but I know it was another blogger who was kindly sharing her photo tips and secrets. Thank you unknown, kind blogger, wherever you are! Tip: Make sure to check the preview below the editing space, before you apply any changes to the blog. 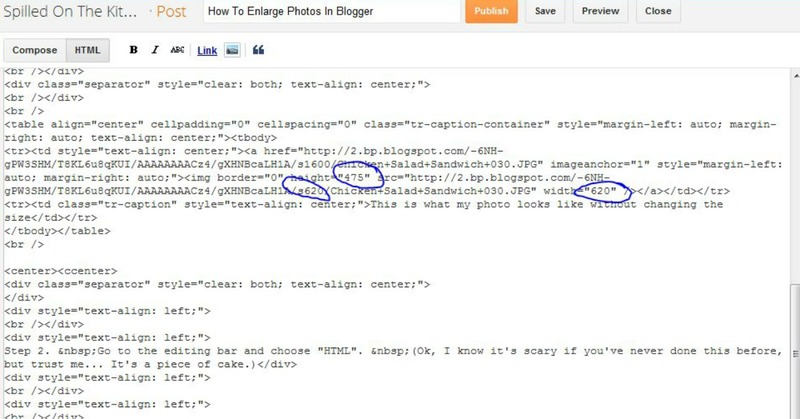 Make sure that your text and photos still fit into the main body and that your widgets, etc. fit into the side bar(s). 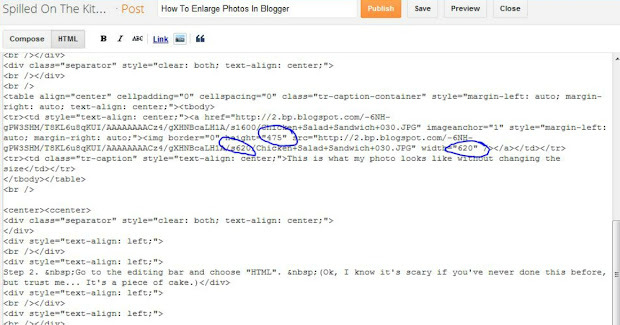 Once you're happy with the layout, click "apply to blog" at the top right of the page. The changes will not take place, until you do. Next, choose "back to blogger". Step 1. Upload your photo(s) to your post as you normally would. This is what my photo looks like without changing the size. It's perfectly fine at this size, but it's lacking the "WOW" factor that I want. Don't worry.... It's OK. Go on... click that button! You can do it!! Look for the HTML code for the photo(s) you want to enlarge. The code will begin with <a href and it will end with </a> The numbers that I've circled are the numbers you'll be changing. Blogger usually sets the height at "240" and the width at "320"
If the main body of your blog is more narrow than mine, you'll need to play around with the height and width numbers. You might want to try: height "340" width "520"
Step 4. Click back to "Compose" to go back to the editing page. This is what my photo looks like now! Yay!!! Why did I choose the proportions that I did? Well, simply put, the blog where I found the information, said these were good numbers to start with. So, I did. And, I liked it. And it fit my blog layout. You can certainly play around with it as much as you like. If you screw it up, don't panic. Just go back to compose mode, delete that particular photo and start over. OK... Now, you can go back to compose mode, do your spellchecking, add your labels and anything else that you would normally do before clicking that "publish" button. Finally, If you have a photo that you've uploaded from another source and it doesn't have a defined height and/or width indicated in the body of the code, there's an easy way to fix that as well. You'll use whatever dimensions you've decided on. Remember: Always "save" and "preview" to check the look of your changes before publishing your post. So... I hope this was helpful. Please excuse the horrible job I did of drawing the arrows and circles on my example pages. At the time I took those screen captures, I only had the snipping tool that comes with the computer and it's very basic. I'll try to pretty them up in the future. I'd really love to get your honest feedback about this tutorial, so please leave a comment with any/all critiques, suggestions and/or questions. I'd also love to hear about what you'd like to see in future tutorials. I'm shooting for Wednesdays as a posting day for these tutorials. "How To Make A Grab Button For Your Blog"
This was actually helpful in several ways. I used to be able to choose left, right, or center. Now, I can see that if I want the photo anywhere but in the center I need to change it in the HTML. I can see where it currently says "center" and I need to just edit that information to reflect "right" or "left" if that is what I want. I was also completely clueless about the ability to customize the "sizing" on my blog. So thanks!! !